Though a rather enjoyable co-op slasher in its own right, 2015’s Warhammer: End Times - Vermintide felt more like a successful but cautious emulation of Valve’s Left 4 Dead formula than a new game from a separate developer. Three years later, Vermintide 2 is on the surface very similar with few substantial changes in design, but it also feels much more confident and manages to shake the lingering sense of déjà vu that permeated developer Fat Shark’s previous effort. While still very much cut from the same cloth as Left 4 Dead, Vermintide 2 expands and improves upon just about every single aspect of its predecessor and ends up being a first-rate combat focused co-op game that actually improves upon the formula in some logical and meaningful ways. Though set in the Warhammer universe, Vermintide 2 is not story or lore heavy, and does not require any knowledge of Warhammer to enjoy. As with the last Vermintide, the End Times setting sees the world overrun with humanoid rats, and now also with Soldiers of Chaos, who are essentially just crazy Viking people with varying amounts of weapons and armor as far as I can tell. A group of five heroes are trying to stop them from opening something called the Skittergate which would presumably make things worse. As a relative stranger to the Warhammer universe, this was plenty of context for launching into the thirteen available missions. As with its predecessor, each mission can be completed solo, but you will need to have three bots tagging along as certain enemies will incapacitate you in such a way that assistance will be required if you want to keep going. While the bots are functional at fighting, saving you and reviving in case you get knocked down, they can behave stupidly during set-pieces and you are much better off playing with a few friends, or using matchmaking to join/invite others. Once you complete the prologue that introduces the basics of the game, you will need to choose one of five characters to play as initially. All characters have some form of both ranged and melee attacks, with the overall focus being again more on melee for most characters. Though Vermintide had a leveling and loot system for each class, character progression has been expanded significantly in the sequel. Each of the five characters has their own set of skill-trees, where leveling up allows you to unlock and equip one of three buffs such as increased stamina or attack speed, comparable to the Perk system in Killing Floor 2. In addition to the default skill tree available to each character, there are two additional sub-classes that grant access to some different weapons and entirely new skill trees, meaning there are essentially fifteen separate classes tied to the five characters. These sub-classes might change a melee-focused character to a more ranged one, or turn a more offensive character to a defensive tank. They will also change up the special ability each character gets to use. These special abilities are also new to Vermintide 2, and are tied to a meter that charges over time and as you kill enemies. These abilities range from offensive damage-dealers like a melee charge attack for the soldier Marcus, to more defensive abilities like a taunt plus infinite blocking for the Dwarf that cause nearby enemies to attack him and give teammates a break. Though it is certainly beneficial to focus on leveling up a single character, I found myself switching between them because only one of each of the five characters can play in a group together. As far as I can tell, this was done because there is a lot of banter between the characters where they taunt each other or commend good performances. The banter is often funny and clever, and can provide some useful tips, like one character calling out another for using a health potion when they haven’t taken much damage, or not blocking enough. It can be an issue if you and your friends want to play as the same character, even if you are looking to play a different sub-class that fills a different role on the team. Fortunately, there is a good deal of overlap between the roles, and starting a new character isn’t so bad because you can swap some equippable items even at level 1, which means you won’t have to start with as weak character when switching between them. What actually matters is your power level, an aggregate strength number comparable to your Light level in Destiny or gear score in The Division. You can shoot subsequent characters up to within striking distance of your highest level hero by crafting and equipping higher power items for level 1 characters. The missions are substantial at around twenty to forty minutes each, well designed and highly replayable. Environment variety has been hugely improved as you will go from crumbling towns to beautiful forests, to farm fields and deep underground mines with horrific nests. They all follow a rough format of going through a series of areas with a mix of wide open terrain and narrow choke points, with levels that are big enough to spend a bit of time exploring but not so big that you get lost. The pacing of the missions is great, with the AI director again randomizing enemy and item placements, and when bosses show up. 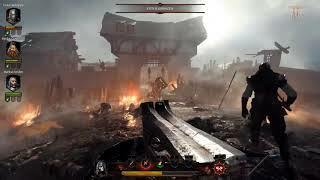 Players are incentivized to explore not only to pick up ammo and healing items, but also to look for tomes, loot dice and grimoires which return from Vermintide 1 and play into the loot system. Tomes take up healing item slots in your inventory and grimoires reduce your maximum health, with the reward for beating a level with these items being improved loot. This comes in the form of loot boxes at the end of every mission, but don’t panic, these are non-monetized and can only be earned by playing the game, meaning they are seemingly well balanced with a good flow of new items. On other hand, the first game already gave you random weapons and items at the end of a mission, so the loot boxes just feel like a needless layer of things to click through. The crafting system from Vermintide 1 also returns, letting you dismantle unwanted weapons and craft new ones of a specific type, and even upgrade favorites that you want to keep using. Though there are a few points during missions where you will need to move explosive barrels around, solve a simple environmental puzzle, or push a cart or battering ram, most of your time will be spent fighting. The melee combat system is similar to Vermintide 1 but it feels tighter and more responsive, and if possible even more brutal and bloody. All classes have access to melee weapons, which all have fast light attacks and slow heavy attacks you must briefly charge up by holding the attack button. Blocking is important, and you must manage stamina here as you can only block so many blows before it becomes ineffective. You can also do damage by aiming for the head, or using certain weapons against armored opponents. There is a great sense of weight to the melee brawls, and progressing through each difficulty level requires both improved gear and a better understanding of the combat system and how to avoid taking damage. There is a lot of weapon variety even within each class, with a huge number of different one and two handed swords, axes, maces, pole-arms and hammers that let you experiment until you find something that suits your style. Ranged combat is also quite satisfying, and the arsenal is equally impressive with bows, crossbows, and all manner of pistols and rifles being available to most classes. The Wizard Sienna is the odd one out, instead using magical staffs that can overheat and kill the player if they aren’t careful. One Dwarf subclass uses a similar overheating system for some fireball-slinging pistols, and even flamethrowers. One of the biggest areas of improvement over Vermintide 1 is enemy variety. You will now face off against both Chaos and Skaven, with a good mix of heavily armored, hard-hitting baddies to contend with in addition to the hordes of weaker ones. All the special enemies such as the machine-gun firing rattling-gunner and hook-rat who grabs one player and drags them away return from the first game, alongside some new ones. One is a warp-fire thrower, basically a green flamethrower, while the other is a chaos sorcerer who will call in tornados that pick up unwary players, spin them around a few times and send them flying in a random direction. Boss variety has also been improved greatly. Pretty much every mission will have one or two bosses spawn in randomly or at scripted moments in the story. In addition to the Rat Ogre from Vermintide 1, there are now a few others that all have more elaborate attacks and behavior. The Spawn of Chaos has a disgusting tentacle arm that can attack players from a distance, and also grab players and chomp on their heads to regenerate health. Another, the Bile Troll, blinds players by vomiting bile at them, and will occasionally sit in a pool of the stuff to regenerate health. These bosses can be tough on their own, and sometimes they will spawn when lots of other enemies are around, making for some frantic and challenging moments even on the lower difficulty settings. There are also special boss fights that occur at the end of each act and in the final mission, which are again some of the tougher fights in the game. One of the biggest drawbacks of the original Vermintide at launch was the lack of optimization and technical issues that permeated the experience. Fortunately, the sequel runs much better, and I didn’t experience any noticeable slowdowns or crashes in the twenty or so hours I spent with the game. I did experience a few minor bugs, such as bosses briefly getting stuck in more confined environments, the boss health-bar not appearing, or audio from enemies playing even after the area had been cleared. Amazingly, the improved performance hasn’t come at the cost of visual fidelity; in fact, the sequel manages to look quite a bit better than its predecessor, with some excellent lighting and good textures allowing the impressive and varied environments to shine. Audio is also quite good, with an excellent soundtrack that ramps up during frantic moments and plays unique tracks at certain points in missions, ranging from intense war drums to more somber mood-setting pieces. Eventually you will be able to tell a certain special enemy or group of tougher baddies is coming based on their unique audio cues alone. The sounds of combat are thoroughly satisfying, making your weapons feel powerful and enemies squishy until you encounter something with heavy armor that your weapon bounces off of with a clang. Warhammer: Vermintide 2 offers up a similar experience to the original, but with improvements and refinements to seemingly every single component, in particular character progression and variety of loot rewards. How long you spend with the game will depend on whether you want to try out different characters, and your tolerance for going through the same levels repeatedly, but there is potentially dozens of hours of entertainment to be had, meaning there is great value for the budget asking price. I can easily recommend Vermintide 2 to anyone looking for a combat-focused co-op game. Vermintide 2 looks and sounds great, nailing the gloomy Warhammer aesthetic while incorporating more colorful levels and moments of humor and levity by means of the excellent banter between characters. The melee combat is tighter and more satisfying than in Vermintide 1, with a great variety of ranged and melee weapons available across the five characters and fifteen subclasses. The levels are well paced and character progression is deep and rewarding. You can play through the 13 levels with bots and still engage in the loot and character progression system, but will struggle to progress to higher difficulties as your AI companions weaknesses become more of a problem here. Though you might not always get to play as your first choice of character, playing with friends is the best way to experience Vermintide 2, and I was generally impressed with the community when matchmaking into random games or allowing others to join mine. The game runs very well frame-rate wise, though it doesn’t use dedicated servers so unless you always host which is a valid option, you will have to deal with the occasionally laggy game or host-migration mid-match. Warhammer: End Times - Vermintide 2 is ranked #393 out of 1434 total reviewed games. It is ranked #15 out of 146 games reviewed in 2018.